Management and personnel have changed over the last fifteen years, but the St. Louis Cardinals continue to be the most successful franchise in Major League Baseball during that time frame. Since 2000, the Cardinals have made the playoffs in 12 of 16 seasons. The fans, however, don’t take success for granted as they continue to show up at Busch Stadium, one of the newest and best baseball stadiums. Baseball is and always will be the #1 sport in town. Don’t forget the Cardinals have the second most World Series titles behind the New York Yankees. Ballpark Village, the dining and entertainment area next to the ballpark, provides a great pre-game and post-game environment. Baseball will always be alive and well in St. Louis at one of baseball's best ballparks. It’s not that easy to find Cardinals tickets on the primary market because of the team’s success over the last 15 years. The tickets that are available can be bought through the Cardinals either online, via phone, or at the Busch Stadium box office. There’s also plenty of inventory and options on the secondary market. Obviously, you have the well-known StubHub or a ticket aggregator (think Kayak for sports tickets) like SeatGeek and ‎TiqIQ. You’ll likely find cheaper pricing there for off-peak days and opponents than what you could buy on the primary market. Ticket prices at Busch Stadium aren’t that cheap compared to the rest of Major League Baseball. St. Louis generally finishes in the top 10 of most expensive tickets in the league. The Cardinals also dynamically price their individual game tickets. Dynamic pricing means the Cardinals use a model to reflect the demand for a specific game and increase or decrease the price accordingly. The Cardinals advertise that this method is good for fans by telling them a large number of tickets went for under $10, but the tickets to the best games went up in price based on the model. The 46,681 that pack Busch Stadium during a sell-out enjoy a great view regardless of where their seats are. The iconic Gateway Arch sits behind center field allowing all but those sitting in the outfield a great view of St. Louis’ most famous landmark. Dynamic pricing has truly eliminated great value seats, so just get the cheapest ticket if you’re concerned about spending money. Your view will still be solid. Getting to Busch Stadium is very easy because of the ballpark’s downtown location. It’s an easy walk from anywhere downtown. Those driving into downtown will find it easy as I-55, I-64, or I-70 all take you right to Busch Stadium. Parking right around the stadium is slightly limited. The Cardinals offer parking spaces at Ballpark Village across the street from the Stadium, but there are only so many. Those spots can be purchased in advance when you buy your Cardinals tickets. Otherwise, there are numerous parking lots within a 10-15 minute walk of the stadium. Taking public transportation to the ballpark isn’t too prevalent in the St. Louis area, but it is available. MetroLink, the light rail system in St. Louis, has a stop right by the ballpark. MetroLink service brings you to Busch Stadium from near the airport, southwest of St. Louis, and from Illinois to the East. It’s also a quick way to get from parts of St. Louis just west of the ballpark. There’s also Union Station, which hosts Amtrak service for those coming from further away. It’s a 20-minute walk to Busch Stadium or you can jump on the MetroLink. There is usually only one option to consider when going out before or after a Cardinals game and that’s Ballpark Village. It’s a great place for food and drink, specifically starting with Cardinals Nation, which also hosts the Cardinals Authentic Shop and the Cardinals Hall of Fame and Museum. In addition, it’s the home of the AT&T Rooftop, an area with ballpark seating that looks into Busch Stadium across the street. The four levels also host a restaurant, where the Gold Glove burger and the tiny soft pretzels are the primary things to be eaten. Most fans that don’t make it to Cardinals Nation end up at Fox Sports Midwest Live, which is at the center of Ballpark Village. It has a 40-foot diagonal big screen, which makes it great for staying and watching the game as well. There’s a bar for drinks and a restaurant to sit and check out the big screen or whatever musical performance that could be going on. The Cardinals also tape their pre-game and post-game from the studio on the second level. Your other options for food and drink within Ballpark Village are the Budweiser Brew House (standard sports bar), PBR St. Louis (country-themed bar), Tengo Sed (Tex-Mex restaurant), Howl at the Moon (piano bar), and Drunken Fish (sushi restaurant). All of these locations get very busy before the game, so make sure you get there early enough to get seating. If for some reason you want to avoid Ballpark Village, your options are limited. Head to Anthony’s, which is just north of Busch Stadium, if you’re looking to grab the best pre-game burger in the area. Paddy O’s hosts the liveliest bar atmosphere for the Cardinals fans that don’t make it to Ballpark Village. Some of the best barbecue in St. Louis is at Bogart’s Smokehouse, which is about a five-minute drive south of Busch Stadium. The brisket or pulled pork should be your go-to there. There are plenty of great ballpark food options once you’re inside. You’ll be amazed at all the different varieties of hot dogs you can get at the Food Network Hot Dog Bar near section 144. The St. Louis Dog, which comes with shredded cheese, potato chips, and barbecue sauce on the hot dog, is the most popular variety. There are many areas around the stadium where you can grab the BBQ pulled pork sandwich, but most people head to Broadway BBQ near section 509 for their barbecue needs. We all love bacon, which is why the All About the Bacon stand on Level 4 is a big hit. Who wouldn’t want to eat ground pork wrapped in bacon, stuffed with more bacon along with cheddar cheese, and put on a bun with some barbecue aioli? Oh wait, there’s more food goodness. Fried chicken sandwiches served on waffles with maple bacon gravy may seem like a Southern hit, but it also does well at Busch Stadium. I’d be remiss not to mention the nachos, which are the most ordered food item. There are the classic nachos, but there are also the walking tacos, which are Fritos or Doritos topped with meat and your usual nacho toppings. Don’t worry we didn’t forget about dessert. There are deep fried Oreos and churros, long Mexican donuts, made with Oreo batter to make you happy. If that’s not enough, the cookies and cream milkshakes are a nice way to finish off your eating experience at Riverview Corner near section 432. 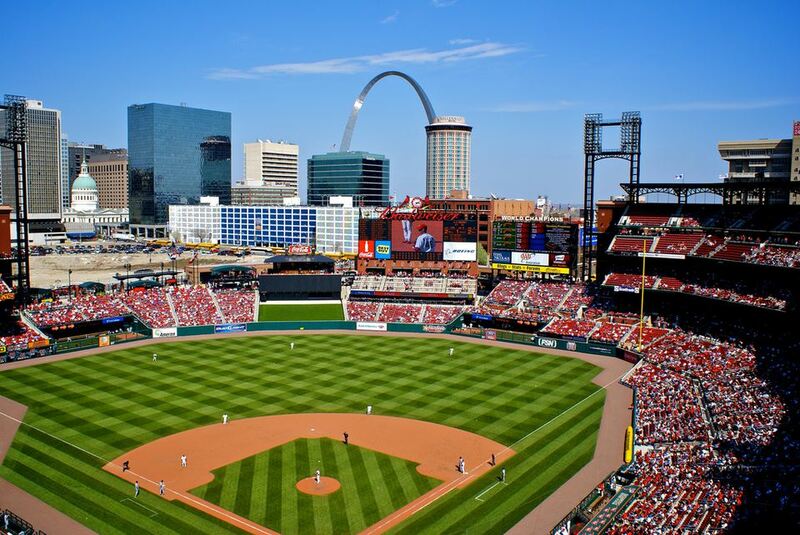 There are plenty of hotels within walking distance or a short cab ride to Busch Stadium. The Westin St. Louis and the Hilton St. Louis at the Ballpark are the two closest, but there are other brand names just a little further away. Wherever you stay, you can use Kayak or Hipmunk again to help with your hotels. Alternatively, you can look into renting an apartment via AirBnB, VRBO, or HomeAway.